How to Call Canada from the U.S.
To call Canada, you can use either your Ooma Telo-connected home phone or the Ooma Mobile app. Then dial the area code, which will be 3 digits. Then dial the local phone number, which is 7 digits. When calling with the mobile app, your call will not use any minutes from your mobile phone plan. Instead, the call will be routed over Wi-Fi or the 3G network. If you’re trying to minimize your data usage, seek out a Wi-Fi hotspot. 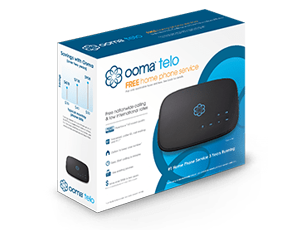 You can also use Ooma Telo to make free calls to any country, and even to the Yukon. If both parties are Ooma customers with Ooma Telo handsets, you can talk for hours without any charges at all, and the call will be in crystal-clear HD. Whether you’re spending hours and hours talking to Canada or just a few minutes here and there, Ooma Telo makes it easy. If you have any questions, get in touch with one of our salespeople via https://support.ooma.com. When using Ooma’s Basic Service, the rate to call Canada is just $0.014 per minute. So a one-hour phone call would cost only $0.84. Using this pay-as-you-go format, the cost for the calls will be deducted from your prepaid account. If you subscribe to Ooma’s Premier Service, unlimited international calls to Canada are included in the plan. Premier Service is billed at $9.99 per month. These Basic and Premier rates apply to all Canadian locations except for area code 867, located in the Yukon, Northwest Territories and Nunavut. These calls are $0.17 per minute. While Basic Service has no monthly fee for crystal-clear nationwide calling, Premier Service offers a whole host of additional features for a low monthly charge. For example, Premier Service customers get powerful call-blocking tools to protect them against telemarketers and robocalls, as well as an Instant Second LineTM for making and receiving calls when your primary line is in use, the Ooma Mobile app for making calls from your mobile phone anywhere you are, voicemail access through email and text notifications, free unlimited calling to Mexico too, plus many others that Basic Service doesn’t provide. Ooma-to-Ooma calls are 100% free regardless of the amount of time you talk, so if your contact in Canada is also an Ooma customer, you can talk as long as you want and it won’t cost a penny regardless of the plan you’re subscribed to. You’ll also have calls in crystal-clear HD voice, which is much better quality than standard telephone lines can provide. By upgrading to the Ooma World Plan, you get unlimited calls to all landlines in 60 countries and mobile phones in 10 countries. The monthly cost is $17.99 for the freedom and flexibility to make as many calls as you like without worrying about how many minutes you’ve spent talking. Upgrading to the Ooma World Plus Plan gives you a larger set of countries included in your unlimited coverage. This plan includes unlimited calling to landlines in 70 countries and mobile phones in 40 countries. The cost is $25.00 per month, and you’ll get even greater flexibility with international dialing. With both of these plans, the same rates to area code 867 apply. Calling the Yukon, Northwest Territories or Nunavut costs $0.17 per minute.